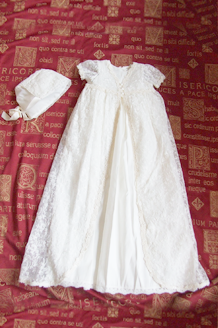 Amongst this collection of delectable baby clothes and infant clothing, you will find all sorts of styles - handmade christening gowns which have been made in England, sourcing the best quality fabrics and trims from English suppliers wherever possible. 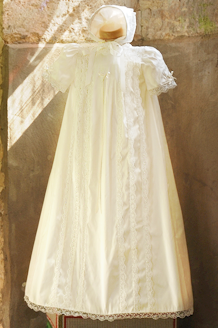 For those that are looking for a lace confection, you will some find beautiful, layered lace christening gowns. 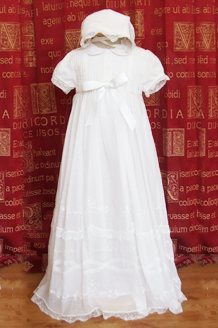 We also have some smocked christening gowns which use the embroidery style (smocking) devised in the middle ages, and used extensively in the eighteenth and nineteenth centuries. We love the celebration of a christening or baptism because they are such a special occasion, where extended families come together and congregations welcome a new baby into their fold. Often families will arrange a get together afterwards, probably with refreshments but it is usually a day time event, with lots of other children around, so this is very much a family event. 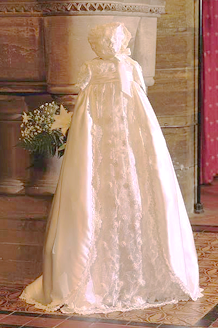 The christening gown as a special form of childrens clothing is of similar importance as a wedding dress is for a bride. Perhaps even more so, because they are often shared around the family and down the generations. Therefore, when looking for a gown, you are not only looking for a beautiful article of clothing for the day, and a photogenic one (for the photograph albums and frames), but also one worthy of becoming a family heirloom.